I always think it's an added bonus when a picture book intended for kids can offer parents some chuckles at their adult level too. 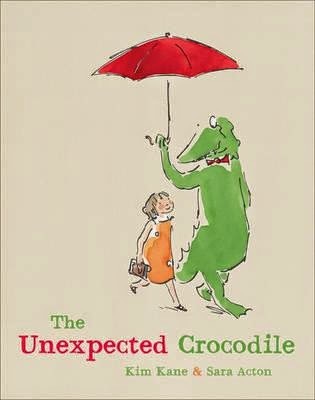 The Unexpected Crocodile is one such book! Peggy's family is having their neighbours, the Dawsons, around for dinner. It's been raining for weeks and there's water everywhere — in the bakery and the library and even on the chops sitting in the kitchen waiting to be cooked. When there's a 'snap snap tap tap' at the door, Peggy's mum assumes it's the Dawsons, but no … it's a rather unexpected crocodile. He's pretty smartly dressed with his red bow tie and matching umbrella and he's not in the slightest bit worried by soggy buns, so he's made very welcome. Next, the Dawsons arrive, in matching sea-blue gumboots and bearing a lavish croquembouche that they just 'whipped up' earlier, because of course, Mrs Dawson's three sons are 'mad for cooking'. It's dinnertime! The barbecue is ready and coleslaw is out on the table. Mrs Dawson proudly proclaims that her sons 'can't get enough veggies', but despite this, all three of them seem very reluctant to touch anything in the coleslaw bowl. Peggy's mother won't be outdone in the parenting stakes so she makes sure to let Mrs Dawson know just how much Peggy loves her veggies too — she's 'forever in the crisper' — plus she spends all her spare time reading to old ladies. Oh yes, parental one-upmanship is well and truly a blood sport! The unexpected crocodile, however, really isn't interested in the coleslaw or how many veggies everyone eats. He has his eye on something (or someone) altogether different for dinner! Kids will love this out-of-the-box story about ridiculous events taking place in such a commonplace setting. Adults will laugh knowingly at the parents as they vie to have the best kids. And Peggy's mum's response to the whole sorry saga should elicit a wry smile too.